Do you have the same questions of watching DVD movies on your cell phone? Actually, you need DVD to mobile phone suite tools to rip and transfer videos from DVD to mobile phone. Here is the complete tutorial for converting DVD to mobile phone. Just read and have a check. Aiseesoft Video Converter Ultimate can be your best DVD converter for ripping DVD to all mobile phone videos. You can convert DVD to various 2D/3D video formats with simple operations. Moreover, it is also supported to convert DVD to same or different video formats at the same time. There is no need to rip all DVD movies. You can convert the selected video clip to your mobile phone quickly. The DVD to mobile phone suite also provides the built-in video editor. You can crop, rotate, clip, merge, add text/image watermark and adjust other video effects. What's more, you can also extract background music as your notification tone without quality loss. All DVD ripping and editing features are well-organized to an intuitive interface. The advanced AMD APP and NVIDIA CUDA technology can make the DVD to mobile phone conversion faster than common tools. Thus, you can convert DVD movies to mobile phone files quickly and easily here. 1. Convert DVD to various mobile phones with customizable parameters. 2. Rotate, clip, crop, merge, add watermark, enhance video quality and apply many other powerful video editing features. 3. Extract audio tracks from DVDs and videos in original quality. 4. Add and synchronize external audio track and subtitle to your video. 5. Support HD/4K UHD and 3D converting. 6. Work with Windows 10/8.1/8/7/Vista/XP (SP2 or later) and Mac OS X 10.7 or above (macOS High Sierra and macOS Mojave included). Download DVD ripper software full version. Insert your DVD disc into the DVD drive. Your computer will detect the inserted DVD disc immediately. Later, click "Load Disc" and select the name of your DVD on the top left corner. Select the mobile phone you are using from the "Profile" list near the bottom. Later, you can get all compatible formats under that category. The DVD to mobile phone suite also allows users to adjust video, audio and 3D settings. 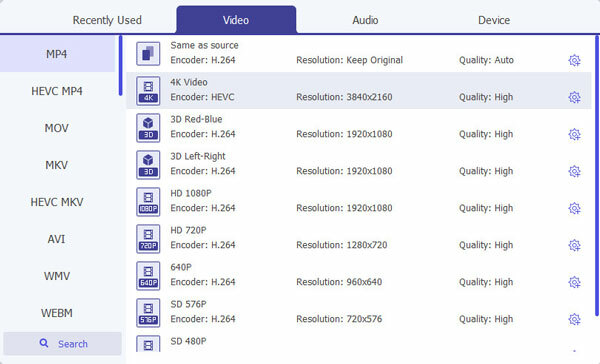 For instance, you can set video encoder, frame rate, resolution, aspect ratio and more. Then click "OK" to save changes and move on. If you want to extract the certain video clip from a lengthy DVD movie, you can click "Clip" on the top toolbar. You can set the start time and end time with the preview window accurately. Click "OK" to extract the mobile phone video clip. 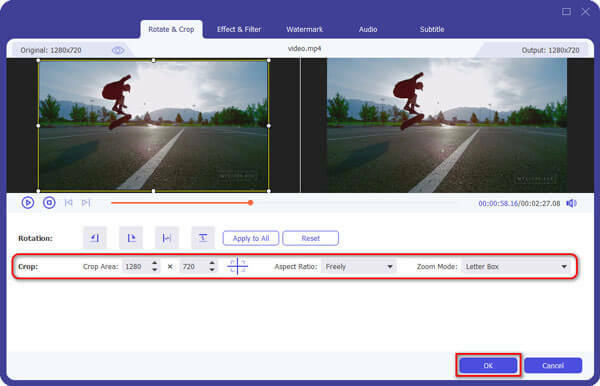 Moreover, you can click "Edit" to access all video editing filters including "Rotate", "3D", "Crop", "Effect", "Enhance" and "Watermark". You can monitor all changes via the Original Preview and Output Preview windows. What's more, you can apply video effects in batch or individually by choosing "Apply to All" or "Apply". A good mobile phone transfer also matters a lot in the DVD to mobile phone suite. FoneTrans is the excellent iOS transfer software for all iOS 12 and earlier users. You can transfer large video files from Windows/Mac to your iPhone/iPad/iPod quickly without data overwritten. 1. Transfer videos, music, ringtones, photos, music and many other files from computer to your iOS device. 2. Create your personalized iPhone ringtone with any song via the built-in ringtone maker. 3. Transfer and convert all HEIC images as JPG or PNG images in high quality. 4. 4.Import and synchronize iTunes data to your iPhone or computer. If you want to put DVD movies to Android mobile phone, you can use Android File Transfer on Mac or Windows to solve the problem. Now you can get your best DVD to mobile phone suite to put DVD movies from Windows/Mac to iPhone/Android. This article shows powerful and easy-to-use mobile phone video converter and transfer software. It does not matter if you have no experience of DVD ripping and transferring before. Just feel free and download the DVD to mobile phone suite right now. Have no idea how to convert FLV to MOV for further editing? Here are 5 free ways to get QuickTime MOV video online or offline. This is a step-by-step tutorial to show users how to convert videos to HTC One and other HTC phones supported video/audio formats. How to transfer contacts from Android to iPhone? This tutorial will show you two simple ways to copy Android contacts to iPhone with FoneCopy and FoneTrans.